Lock in a great price for Villas Flamingos Beach Front – rated 8.9 by recent guests! The onyl hotel on the island with a pool overlooking the ocean. The whole property faced the ocean. The rooms were beautiful and modern. Our sea view was completely uninterrupted. The staff were super friendly and helpful. The beach was the best on the island - clean, shallow and crystal clear. Excellent relaxation. The shallow water/sand bar makes the vibe SO mellow and relaxing and there are no hard surfaces anywhere- just sand everywhere. Wonderful! The resort was accommodating and helpful. Since I do not speak Spanish, it was nice that the hotel made arrangements for transportation, excursions etc. We were able to totally relax and enjoy the beauty of Holbox. The hotel staff took great care of us. Everything was amazing, location is nice and quiet, views, beach, resturant. Swimming with whale shark is a must !!! We had a room with a sea view and the hotel lit an extra bed in for our older boy and a cot for the baby at only a small extra charge. The view was breathtaking. The room spacious and super clean. But the real highlight was the staff. They were AMAZING. We will definitely be going back. It was truly paradise. The location, although it is one of the most remote hotels from downtown, has this great advantage, the hotel is directly on the beach, it does not cross the street in the middle as in almost all others. The staff is amazing and the rooms are pretty good. We loved every minute of it. The staff, the room, the property, the food, the location - everything was perfect!!! The location was good, the free kayaks and bikes a plus. 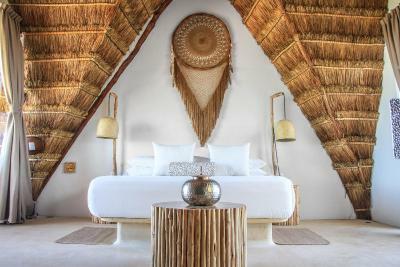 Villas Flamingos Beach Front This rating is a reflection of how the property compares to the industry standard when it comes to price, facilities and services available. It's based on a self-evaluation by the property. Use this rating to help choose your stay! 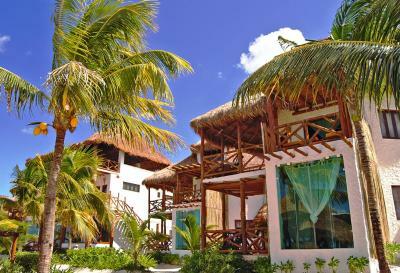 Villas Flamingos has bungalow-style accommodations next to the ocean. Each room has a balcony with hammocks and a private bathroom. The hotel has scuba diving, kayaking and snorkeling activities for an extra charge. There are regular ferries from the island to the mainland town of Chiquilá, which is around a 90-minute drive from Cancun International Airport. When would you like to stay at Villas Flamingos Beach Front? This room comes with 2 double beds, and features an interior pool with a panoramic window with sea views. It also has a private garden with exterior shower and a private terrace with seating area. This air-conditioned suite features 2 queen beds. It comes with a ceiling fan, a terrace with a hammock, a coffee table and private bathroom. This bungalow features 2 queen-size beds and has partial views of the sea. It comes with a private garden and an interior pool with large windows offering panoramic views. It also includes a terrace and a seating area. This room is distributed in two stories. In the first floor is the masted bedroom, terrace and a full bathroom with both an indoor and outdoor shower. The second floor has the hot tub area and large windows offering panoramic views. Air conditioning, a small fridge and a safe are also included. This room features two large double beds or one extra large double bed, a private terrace with a hammock, mini-bar, safety box and sea view. Distributed in two different stories, the first floor has the master bedroom, a terrace and a full bathroom with both indoor and outdoor showers. The second floor holds the hot tub private area that includes large windows offering panoramic views of the seafront. The other amenities available include a small fridge, safe and a table with chairs. House Rules Villas Flamingos Beach Front takes special requests – add in the next step! Villas Flamingos Beach Front accepts these cards and reserves the right to temporarily hold an amount prior to arrival. wifi in the room was non existent, but in a location like this that is a blessing in disguise. Awesome hotel in a great location. 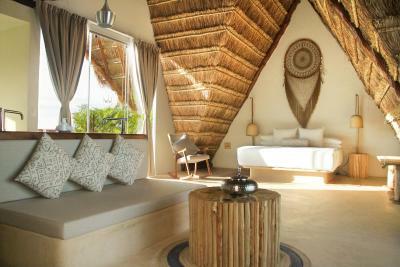 Our room was overlooking the marvellous white beach and blue waters of Isla Holbox. We occupied the holiday suite and so the room included a Jacuzzi, second outdoor shower and very spacious balcony. Service overall was fantastic, as were the breakfast and lunch facilities. In addition, the dinner they serve in the restaurant or as room service was unprecedented. I highly recommend the pulpo! Location, amenities, staff were all terrific! We understand there is a culture and there are a lot of stray dogs in Holbox which people are fine with. It becomes a bit of an issue at meal times as the dogs tend to come expecting food, probably not helped by some guests giving them food. The staff didn't seem too bothered about shooing the dogs away. Also we had a few issues with the sun loungers in that some guests would reserve them with towels at 8am and then not use them all day, leaving other guests unable to find available sun loungers. The beach side is perfect and it is great that there are not hundreds of sun loungers as it keeps the feeling more relaxed, however I think the hotel should be more strict on guests reserving sun loungers all day and not using them. These are small issues that the hotel could fix to become perfect, but overall we loved our stay. Room was very comfortable and the location is just spectacular. It's the second to last hotel on the beach strip so it is very peaceful and quiet. The beach doesn't have the road adjacent like most of the other hotels on the strip. They let use bikes for free and it's just 5 minutes ride into the centre. The staff are extremely friendly and helpful, the facilities are great. This is a 4 star resort with a US/European price level meaning nothing comes cheap here. The staff is also used to US style tips and points that out at every bill, even at breakfast which is included for free - so why should I tip for a breakfast buffet? When we finished breakfast and went on to explore the island we were followed by staff to 'sign for breakfast" - why?!? To give more tips? We weren't the only guests who found this strange, not sure why this is encouraged.. The new big pool was closed again as it was broken but during our week there no one repaired it. The staff is fantastic and incredibly accommodating. Due to the location right on the beach (you will wade through the water to get to the sandbanks at low tide for the real beach), the resort was flooded and covered in seaweed when we arrived. The staff had set up sun loungers as bridges and pumps to drain the flooding and they spent the next day shoveling seaweed to make everything nice for the guests again. The location is excellent away from the noisy road, giving this property an exclusive resort feel. This is a full 4 star resort with clean, spacious airconditioned rooms and a fantastic restaurant serving great Mexican and American food. Try the cevices! The Christmas dinner was lovely. The pool is great and all the kids there really enjoyed themselves. Come here if you are looking for a digital detox and total relaxation! Only the last buildings is newly build. We got other building so the photos of the room do not match. Gap of the reality and expectations from the photos. Staff and the surrounding are awesome. Clean privat beach, sea view, pools, restaurant. Kids friendly. No WiFi in rooms. Had to wait a while to check in as there was a queue. Good beach location but about 30 minute walk to the town. Just a little overpriced for what you get for the money. Lovely beach house with sea view. Nice contemporary stylish decoration inside and a hammock on the balcony. Very clean and a nice spot on the beach - other parts of the beach had a seaweed problem but the hotel had kept this part clear. Nice breakfast including fresh fruit, freshly cooked eggs and pancakes. Mosquitoes everywhere at sunset. Spending a week at the resort the menu becomes suddenly more limited. It's a place You don't want yo leave. We have ordered this place due to the good reviews that it got on booking. Before we arrived we were expecting a 4 star hotel but when we arrived we saw this place and it is more like an hostel. Dirty and outdated rooms, the sheets has lots of stains and the room smells horrible. We asked for a different room since we paid 240$ per night and at first the staff (which is very rude) did not want to change but after we refused to stay in the room they replaced us to a room which was more dirty then the one we got in first place so we returned to the first disgusting room. Then when we went to the restaurant (which is much more expensive than the other 4 star hotels in holbox) we ordered a burger and the sea food, both of the dishes tasted horrible and we got sick on the same night. The place is far from the center (and actually this is the hotel which is the most far from center) and when we asked for a taxi from the reception it took around 25 minutes of waiting. 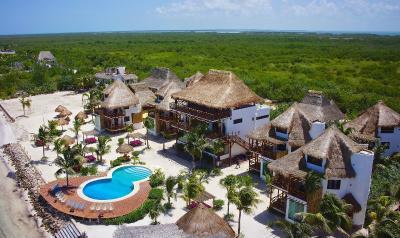 There are lots of good hotels in holbox in the same price and even cheaper. Do your self a favore and order other hotel, this hotel is more like an hostel and there is absoloutly no value for money. The indoor Jacuzzi, excelent breakfast and the quite area.